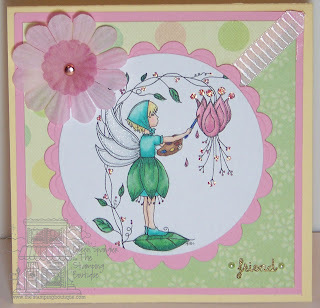 The Stamping Boutique is sponsoring this week's I Did It Creations Challenge - it's a sketch. Image is from The Stamping Boutique colored with Copics and Spica glitter pen. Paper is PTI and K & Co. Circles are cut with Nesties, sentiment is PTI, pearls are Kaiser, ribbon is from my stash, flower is Darice and I also used Fruit Punch Stickles. So pretty, love the soft colors and the beautifully colored image. Such a lovely card, I too love the soft spring color pallet! Beautiful coloring, this is another winner! Love how soft this is... very pretty!